AN eight-year-old girl has died in a double fatality on her way to a primary school netball carnival in Bundaberg. Childers first responders today had the horrific task of informing a south-east Queensland family their daughter was one of two people tragically killed in a horror head-on along the Bruce Highway. About 1.20pm emergency services crews responded to reports of a serious, two-vehicle collision 5km south of Childers. Two RACQ Lifeflight Rescue helicopters were dispatched from Bundaberg and the Sunshine Coast respectively and arrived on scene shortly after the call came through. Queensland Police Service said the two fatality victims - an eight-year-old girl and a man, had both been pronounced dead at the horrific scene. Photos from the crash site show debris from the wreckages strewn across both lanes and on the each side of the roadway. A police spokesman said the male victim, whose age could not be confirmed, was travelling south in a ute by himself. 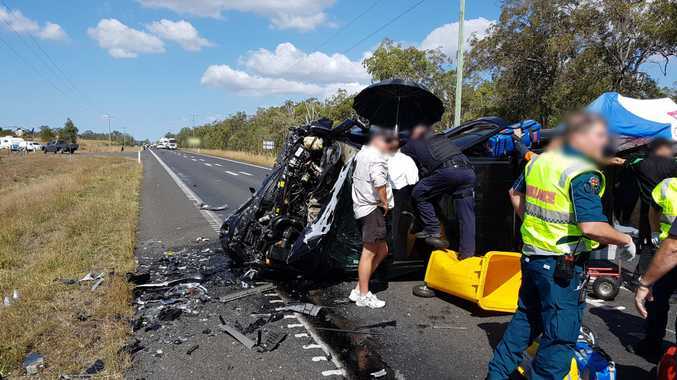 The eight-year-old girl, who was one of three passengers in the second vehicle, was in the car travelling north toward Bundaberg. 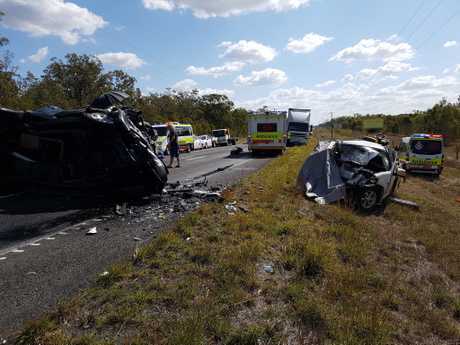 The other victims travelling in the northbound sedan, a woman and an 11-year-old girl, were en route to the Samsung Primary Schools Cup - a sporting event hosted by Netball Queensland. The competition was scheduled to run today and tomorrow at Bundaberg Super Park. 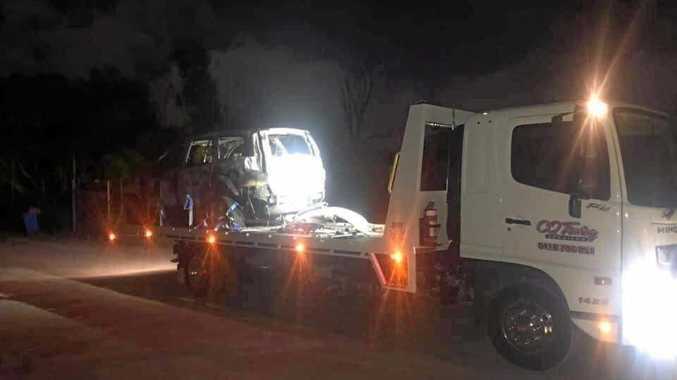 Childers Police Officer in Charge Sergeant Geoff Fay confirmed the woman and two girls were on their way to the netball carnival with other cars in convoy when the shocking collision unfolded. "It was a number of people travelling together to a netball competition in Bundaberg this weekend," Sgt Fay said. He said it was a tragic set of circumstances which would deeply impact emergency services personal and the wider community. "The officers are traumatised by the whole thing, particularly when you're dealing with an eight-year-old child that's passed away," he said. The 11-year-old girl and her grandmother were treated by paramedics at the scene and flown to Sunshine Coast University Hospital in a serious condition. The Bruce Highway remained closed near Ross Camp Rd in both directions for hours and traffic diversions were put in place.